What’s it about? The Phoenix Force is back, folks, and along with it, the adult Jean Grey. As is usually the case with the Phoenix’s return, the X-Men are simultaneously excited and terrified at the idea of what all the cosmic entity might bring along with it this go-round. What do I need to know? Even though it’s been years since Jean and the Phoenix were properly “alive” at the same time, the two have been running around Marvel’s comics in one way or another for a while now. After Jean supposedly died in X-Men: Phoenix—Endsong, the Phoenix (seemingly independent of Jean) resurfaced briefly in X-Men: Phoenix—Warsong where it was temporarily bonded with the Stepford Cuckoos, before being expelled in a sequence of events that led to Emma Frost swearing that she would destroy it were it ever to return. When the mutant messiah Hope Summers first appeared as a baby, the Phoenix force momentarily manifested in her eyes, hinting that she might either be a reincarnated Jean or a potential host for the force. Eventually, the Phoenix (again, separate from Jean) would come to claim Hope as its next host, but its plans for rebirth were foiled when it was split up and placed into the bodies of five other X-Men. The Avengers, who rightfully saw the Phoenix Five as a major threat, went to war with the X-Men and the conflict culminated in Hope and the Scarlet Witch combining their powers to wish the Phoenix out of existence. The Phoenix’s erasure was eventually undone by the events of Secret Wars, which effectively reset much of Marvel’s 616-universe. Meanwhile—a teenage version of Jean Grey from the distant past has also been adventuring on her own and with her fellow young X-Men, much to the confusion and dismay of her peers from the future. While Jean’s shown herself to be quite different from the older version of herself that most people know, she’s been preparing for the day that she’s inevitably forced to confront the Phoenix for the first time herself. It’s unclear how Teen Jean and Adult Jean will come face to face and whether they’ll have to somehow share the Phoenix, but one imagines that that’ll be explored in Resurrection. What’s it about? All of the various Avengers teams refusing to back down from a fight with a new, world-threatening force. What do I need to know? No Surrender will bring together the proper Avengers, Uncanny Avengers, and the US Avengers for a weekly event that spans across all three teams’ individual books. 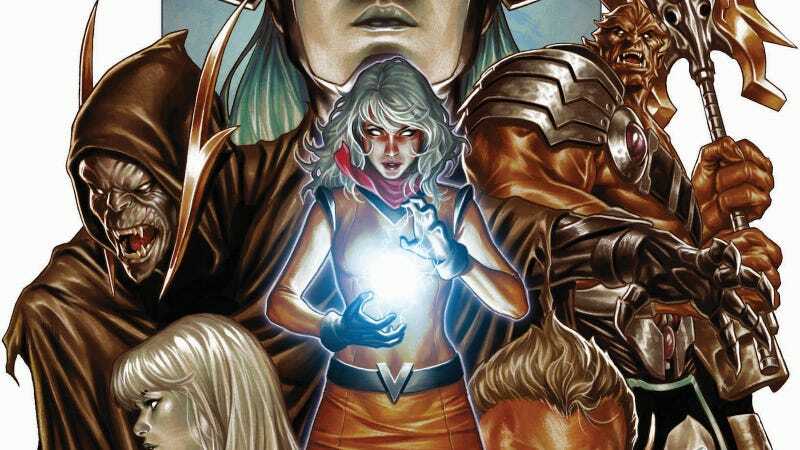 Specific details about the event are scant, but the main selling points Marvel’s been pushing are that the Earth will supposedly be stolen, setting off a chain of events that brings multiple generations of Avengers together along with the Voyager, a “new” Avenger some suspect may be Valeria Richards. When’s it out? Some time in February. What’s it about? A very powerful piece of costume jewelry most often associated with a certain Mad Titan. What do I need to know? In the same way that the Phoenix Force’s presence is always cause for some degree of alarm, the Infinity Gauntlet and its Stones (or Gems) are kind of a big deal. Over the past few weeks, various Marvel heroes have stumbled across different Infinity Stones that have been scattered across the world, meaning that the full Gauntlet’s yet to be assembled. Someone’s likely to wanna change that sooner than later. The first teaser for the event features Wolverine, Captain Marvel, and Star-Lord each in possession of a different Infinity Stone, meaning that the other three and the Gauntlet itself are out there somewhere. What’s it about? Doctor Strange is cleaning up Captain America’s Secret Empire mess. What do I need to know? Even though the rest of Marvel’s universe has seemingly forgotten that the evil version of Captain America decimated Las Vegas and murdered thousands of people because that’s what Nazis do, Doctor Strange is on the case to straighten things out. At the end of Secret Empire, Kobik restored much of the damage that Stevel wrought upon the world while leaving certain key things as they were: Black Widow’s still dead and Vegas is in ruins. In Damnation, Strange will set out to help put Vegas back together through magical means and his path will cross the likes of Blade, Moon Knight, Ghost Rider, and Iron Fist. What’s it about? Somebody’s getting hitched! What do I need to know? Marvel hasn’t announced who is supposed to be getting married, but the choice of pictures included in the wedding are... telling, because pretty much all of those marriages fell apart.